This is the Beccariophoenix formally recognised as the "windowed" B. madagascariensis. It has now been recognised as a separate species (Dransfield & Rakotoarinivo, Palms, 2014). It differs from B. madagascariensis in that the sessile inflorescences are always infrafoliar, not interfoliar as in B. madagascariensis; pointed staminate flower buds, not blunted; and of-course the characteristic seedling morphology where it has broader leaflets with the distal-most joined to form a broad bifid fan or flabellum but partially split near the rachis to produce conspicuous windows. 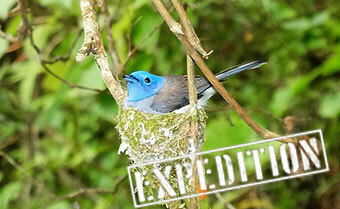 Originally only known from the single tree by the roadside at Ranomafana Est 18º58’5.76”S 48º51’16.86”E. Then in 2005 another population was discovered about 17 km SW from the single tree, growing among graves. It is quite probable that it is the graves that has saved this Critically Endangered species as the palm has traditionally been felled for its edible palm-heart. Occurs on highly disturbed remnant vegetation with lateritic soils rich in organic matter, elevation 60-160 m. This palm occurs at the lowest elevation of any Beccariophoenix, thus making it the least hardy (10b), although it is the fastest growing in cultivation and the best suited as a house-plant. Beccariophoenix fenestralis Superposition d'image ©2019 Trebrown - Copie non autorisé sans autorisation préalable.